After the off shore leg from Block Island to the southern tip of New Jersey, we welcomed a couple of days in one place. The anchorage in Cape May harbor is one of these that has a strong enough tidal current that you end up re-orienting every 6 hours. For half of the time, the wind is coming over your transom and you are over your own anchor chain. This increases the risk that ones anchor will drag or not re-set and can be disconcerting; but we have been practicing anchoring regularly these past two years and felt confident in the holding thus we were able to leave Argon unattended while exploring the town. 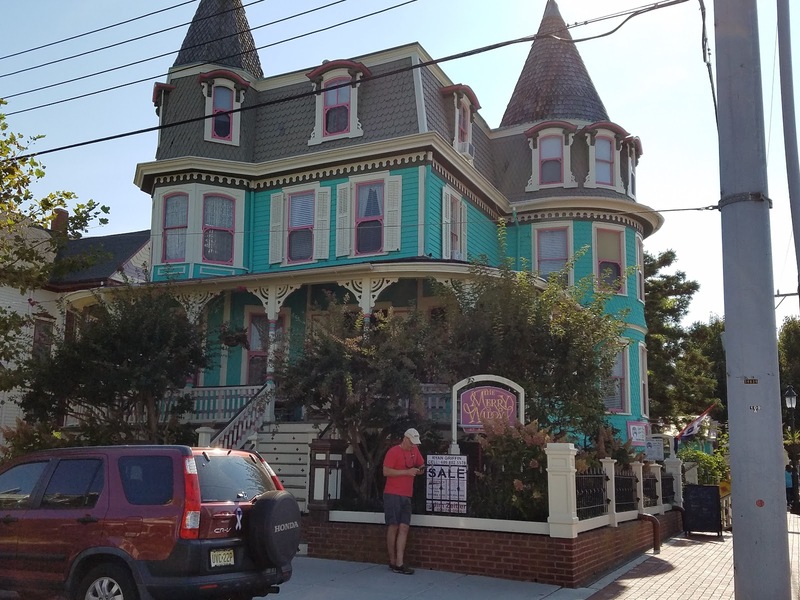 Cape May is one of the oldest seaside resort communities in the US and the entire town has been designated a National Historic Landmark because of its many Victorian homes and buildings. (Cape May is second only to the much larger San Fransisco regarding the number of Victorian buildings in the US.) Its harbor is filled with commercial and pleasure fishing vessels of all kinds. 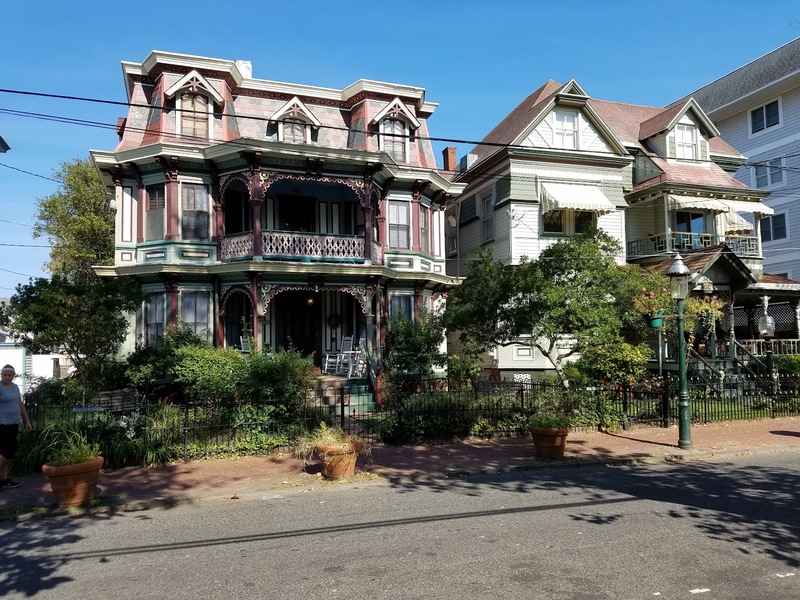 A couple of the many Victorian buildings that line the main streets of Cape May all leading to the vast beaches that curve around this southern peninsula of New Jersey. 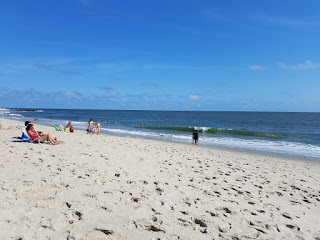 I was able to go swimming very near a school of dolphins that were feeding along the beach seemingly not bothered by the proximity of people. We departed Cape May Harbor well before dawn 19 September to time the flooding tide at the mouth of the Delaware Bay. We had planned on a 50nm sail stopping to anchor for the night at an unattractive but functional alcove before proceeding northward to Philadelphia. We decided to skip the rest stop and to skip Philadelphia (which would have been 35nm up the Delaware River potentially requiring a lot of motoring, followed by another 35nm run back down the river). We proceeded through the Chesapeake and Delaware (C&D) Canal that same day resulting in a generous run of 80nm over about 14 hours. Miah Maull Shoal Light in Delaware Bay. Elbow of Cross Ledge Light in Delaware Bay. Delaware Bay is a major throughway for tankers, barges, and cargo ships. The C&D Canal connects the northern parts of Chesapeake and Delaware Bays. The canal is 14 miles long and has 7 bridges. The C&D Canal is lined with lush marsh lands. We finally set the hook in the early evening hours at the mouth of the Sassafras River about 12nm southeast of the Chesapeake end of the C&D Canal. The Sassafras River has some beautiful and calm anchorages. The silence is broken occasionally by various booms from the Aberdeen Proving Ground over on the west side of the bay. They have definitely proven that they can blow stuff up over there. Anchored at the mouth of the Sassafras River after a very long trip from Cape May up Delaware Bay and across the C&D Canal. Working on my paddle boarding skills in the calm, protected waters. After a few days of sailing and much examination of the charts, Bob has taken to referring to the northern part of the Chesapeake Bay as America's Mud Puddle. I hope this is not offensive to locals or those with fondness for the area. The waters are mostly shallow with vast areas off-limits to boats that draw 6-ish feet like Argon. The dredged channel cutting the center often must be used not only for the large commercial vessels that transit this waterway but also for many pleasure craft. There are a maze of rivers flowing in to (and out of) this brackish bay washing in the fine silt and clay that causes the water to be grainy and opaque. 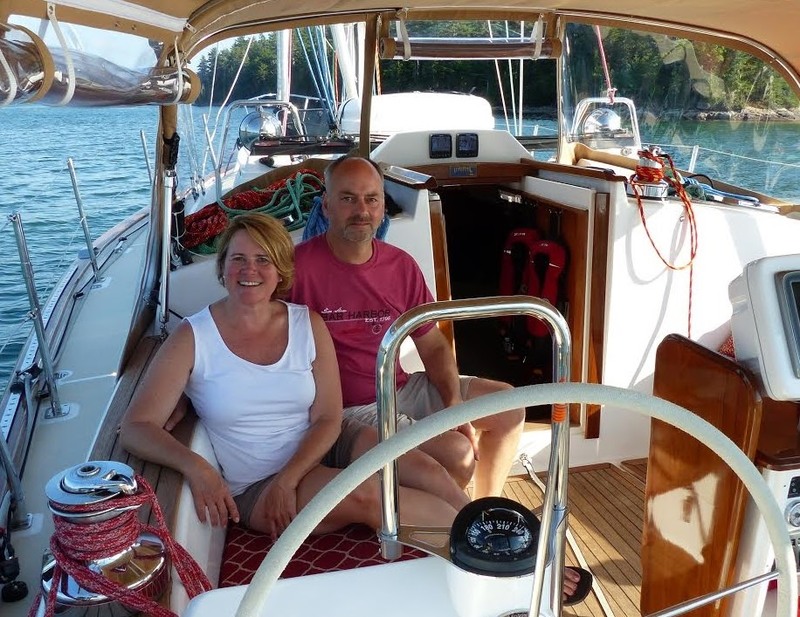 However, the water temperature was an inviting 80 degrees and the myriad of inlets and coves provide seemingly endless opportunities for anchoring and exploring. 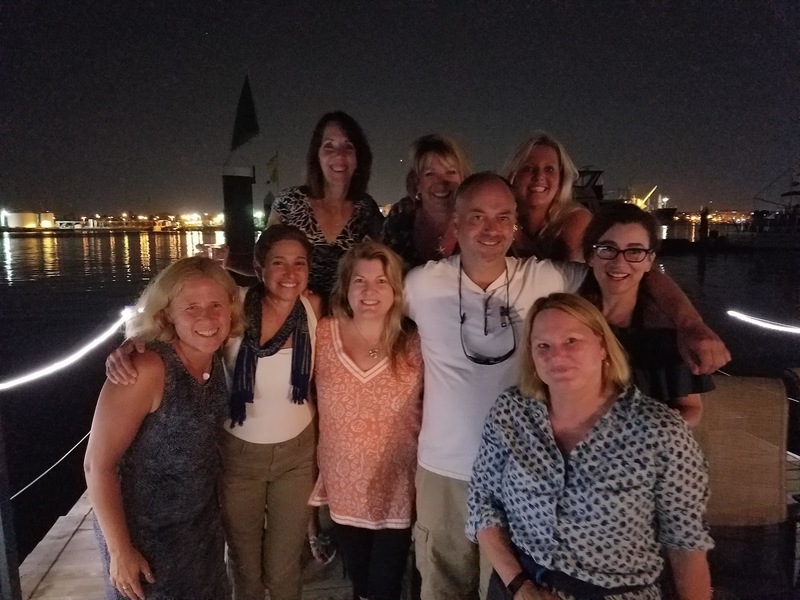 After a peaceful evening in the Sassafras, we decided to head to the town of Havre De Grace at the mouth of the Susquehanna River. Bob's home town of Binghamton, NY is a few (hundred) miles upstream. We stayed at Log Pond Marina which is a bit of a work in progress since it changed hands a few years ago. Earlier this year, they spent about $700,000 dredging the marina slips and fairways. This is apparently a losing battle with all the silt brought in from the Susquehanna. 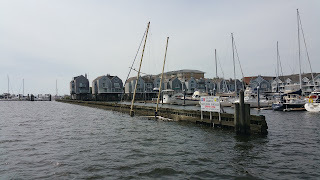 They are in the process of replacing all the docks but have not gotten to the section where we stayed. 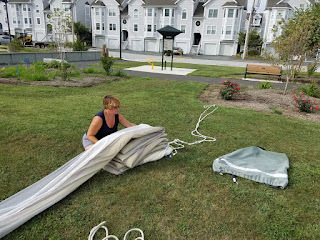 Some negative reviews on Active Captain left us wary, but compared to some of the docks we're used to at home, these were really not all that bad. 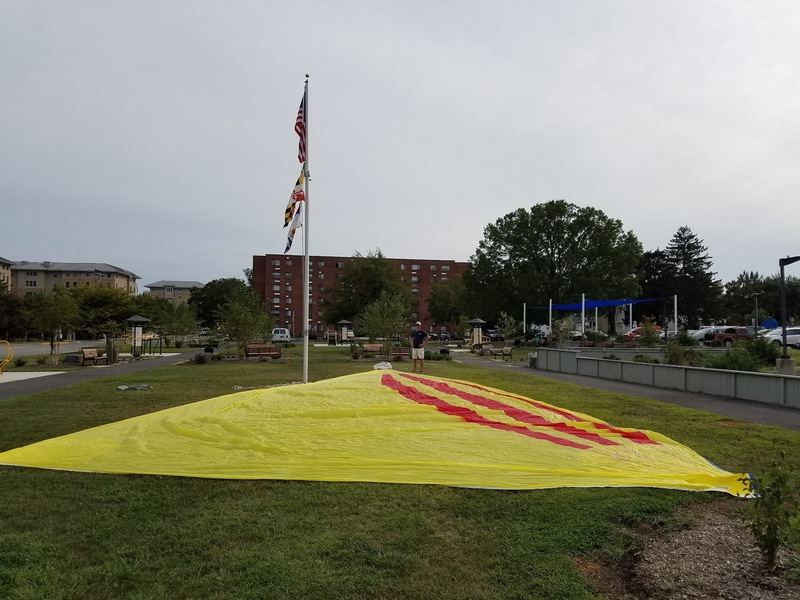 As we initially approached Havre de Grace, the instructions from the dockmaster were something like "pass the big condos to port, then the small condos, and our entrance is right after the wrecked sailboat". Well, he was right - a partially sunken ketch made a very unmistakable landmark. This ketch broke free from a mooring in the Susquehanna and wrecked/sunk against the marina's bulkhead. Apparently, the owner only owned her for five days when this happened. If you look closely, you can see that the jib is still furled on the headstay. Havre De Grace is a cute town with some great restaurants. We ended up staying three nights so I guess our review is pretty good. We visited the Decoy Museum and are now better informed about duck hunting and the history of decoys. 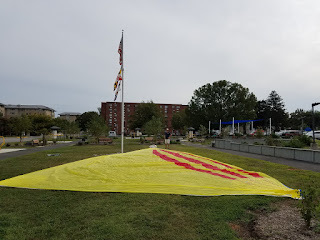 Havre de Grace was also the primary town on the Eastern route of the underground railroad in Maryland as slaves could cross the Susquehanna in to free territories of Pennsylvania and on to Philadelphia and New York in the 1800's. While we had access to some flat/grassy areas, we took the opportunity to straighten out our twisted up spinnaker. 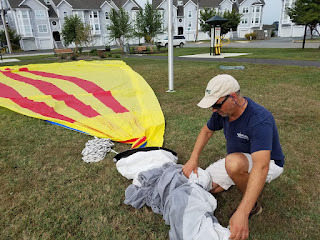 Untwisting the spinnaker and sock. 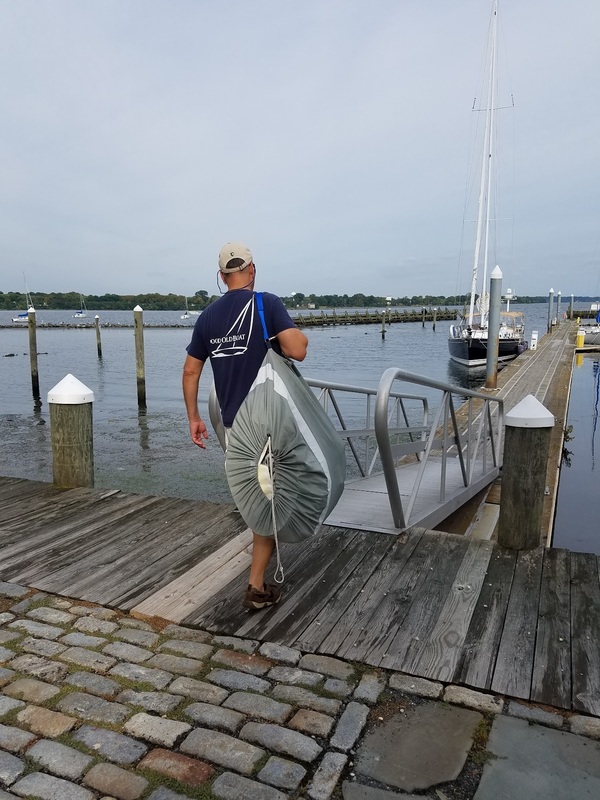 Bob transporting the spinnaker back to Argon docked at Log Pond Marina in Havre de Grace. We continued to explore several beautiful anchorages in the mud puddle. A rare heavy rain shower gives Argon a much needed rinse while at anchor. 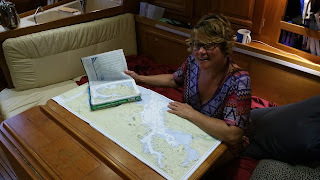 Most evenings we examine the charts and cruising guides to decided where to go next. Thinking and writing anchored at Morton Creek. Another spectacular sunset across the Chesapeake Bay as experienced from anchor at Morton Creek. Early mornings are my favorite time of the day. This is my office these days. This veil of morning fog over part of the horse farm that lines one side of the anchorage in Eagle Cove. Sunrise while anchored at Eagle Cove - an inlet off the Magothy River just a short hop south of Baltimore. Not bad for a mud puddle. Next it was time to be city folk again for a few days. 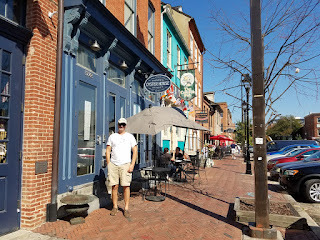 We docked at Henderson's Marina in the trendy Fells Point neighborhood of Baltimore and spent time exploring not only a bit of Baltimore, but also taking a train in to Washington DC. 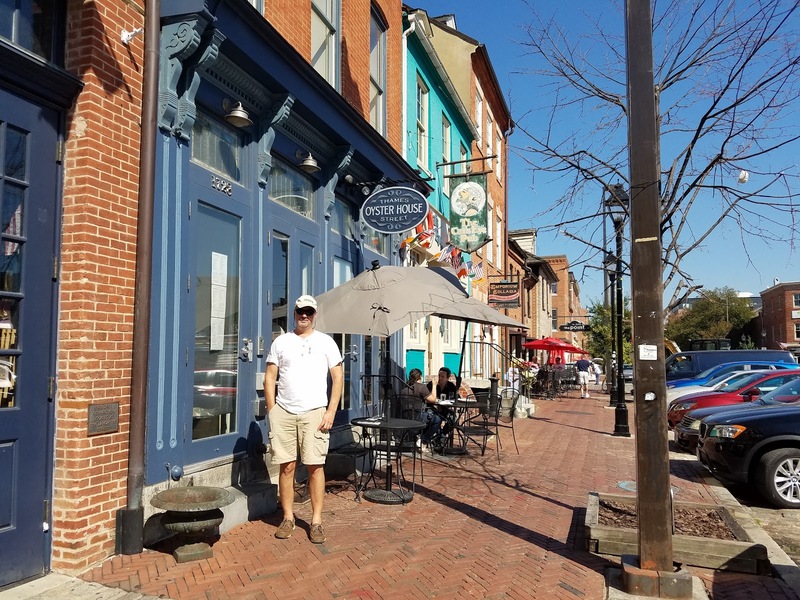 The streets of Fells Point are lined with an enormous number of restaurants and bars. Fells Point is along the water just east of the more popular Inner Harbor. 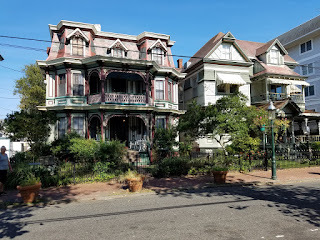 Fells Point reminds us of Charlestown, MA (our most recent Boston home). There are lots of yoga pants, baby carriages and designer dogs. 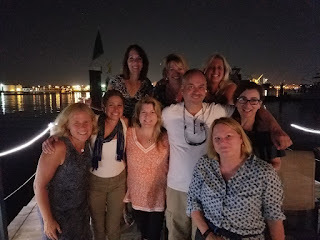 These friendly ladies invited us to join their "Women that Wine" gathering at the end of the docks. Bob was the only non-woman of the night. More socializing in DC with Kelly, Christine, Lori and Todd. Bob got to meet Andy Zaltzman after his show in DC. Andy is a British comedian / satirist who regularly performs in London (SoHo). 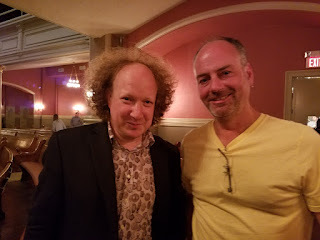 Bob is a devoted listener to Andy's podcasts including The Bugle and was excited to see that Andy was doing a US tour with a performance near us. Now time to make our way a bit more southward as we continue to explore Chesapeake Bay. 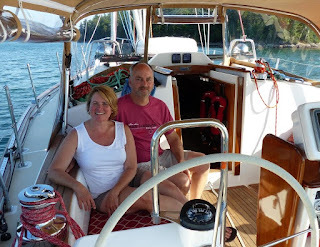 We have been blessed with fantastic weather all summer but seem to be in for a spell of unfavorable conditions for a few days so we may just sit tight in a calm anchorage for a bit. Next major attraction for us is Annapolis... a drinking town with a sailing problem. Until next time... we ARe GONe! Enjoying your journey! Pictures are terrific! Safe travels. Thank you, Rob! 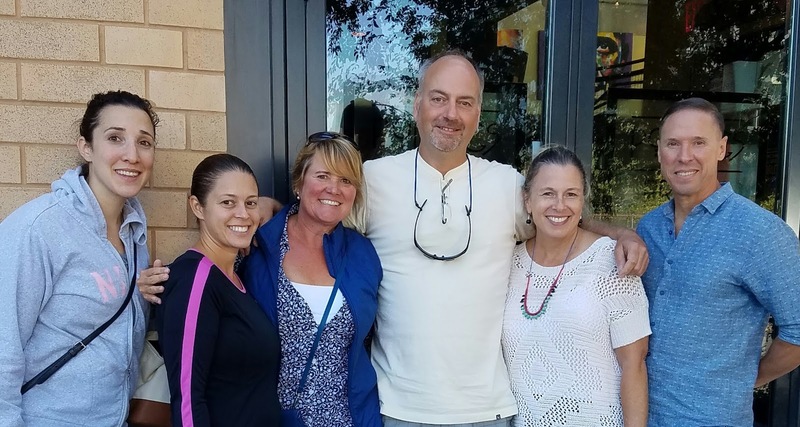 We miss our Constitution Marina friends but are loving the early days of this journey!